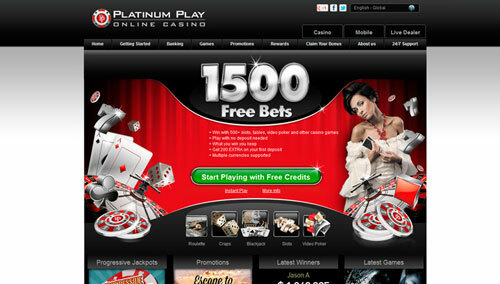 Platinum Play Online Casino - Sign up and get 1,500 free bets! Up to 1500 Free Bets! Platinum Play Online Casino has been operating since 2004 and uses the famous Microgaming brand of casino software. The casino is licensed in Malta and uses SSL encryption to secure the connection between the player’s computer and the casino servers. This ensures that all private information belonging to players stays secure and private. The casino is part of the Fortune Lounge Group, one of the biggest and longest-standing online gambling operators in the world. Platinum Play online casino has received certification from eCOGRA, which confirms that the games are fair and that the casino treats its players well. Various bonuses are available for new players, like a 1,500 free bets offer and a 100% match bonus of up to CA$200. This casino has a comp points system, where players earn 1 point for every CA$1 wagered on slot games. The points can then be redeemed for casino credits. The casino’s payout rates were 96.41% for all games according to the last eCOGRA audit. Canadian players have access to various banking methods to deposit and withdraw money, like credit and debit cards, various eWallets and bank transfers. The casino has a mobile version, which can be accessed on almost all Android, iOS and BlackBerry smartphones, in addition to other mobile devices that use a Symbian or Java platform. Platinum Play Online Casino has hundreds of different games, so no matter what kind of gambler you are, there will be a game that you enjoy playing here. Games that are the most popular with players include video slots like Thunderstruck II and Tomb Raider, as well as the Mega Moolah progressive slot game. New players receive 1,500 free bets when they sign up and have the chance to keep, up to CA$100 of their winnings from these bets as a bonus. 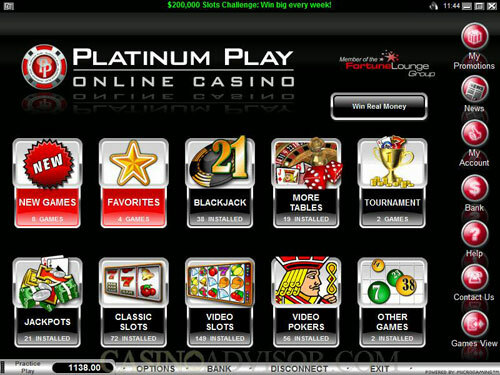 Platinum Play offers a downloadable casino, a flash version, a mobile version, as well as some live dealer games.